In 1915 an old Brentham landmark disappeared when the Pitshanger farmhouse at the east end of Meadvale Road was demolished to make way for a cricket pavilion and a five-acre playing field. The new sports ground was opened on Whit Monday by the Rt Hon. John Burns, M.P., President of the Local Government Board and an early supporter of the co-partnership movement. The amenities of life in a co-partnership suburb were many and varied. Ealing Tenants had their own club, at first at 73 Woodfield Road in just one room, and then at 33 Woodfield Crescent. Despite its limited accommodation the Brentham Club was a centre of social life on the estate. Dances, whist drives, concerts and lectures took place regularly. Before the opening of the sports field, cricket matches were played on the undeveloped part of Brunner Road; while tennis and bowling matches, and open-air dances and concerts took place on the open space between Woodfield Crescent and Pitshanger Lane which was later made into allotments. Before its demolition the Pitshanger farmhouse was used for woodwork classes. A horticultural society and gardening school encouraged tenants to make the best use of their plots. As the population of Brentham grew, however, the need for a permanent social centre was felt. 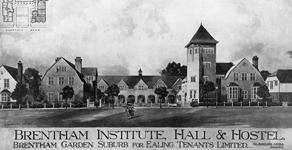 This was achieved in 1911 with the completion of the Institute in Meadvale Road, now the Brentham Club. In addition to the actual Institute building, the original scheme for this northern boundary of the estate as planned by the architect, G. L. Sutcliffe, included a hostel linked to the Institute by a series of arches, and behind the arches facing the road a second large hall. But these extensions were never carried out. In its new building, however, the Brentham Club launched out with a wide p rogramme of activities. As well as indoor and outdoor games, classes were started in art, needlework, cookery, first-aid, folk-dancing, horticulture and languages (including Esperanto). A nursery and kindergarten was started for the youngest children. Flower shows and pageants were regular events, while the additional recreation grounds made possible the holding of an annual sports day. 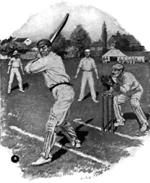 The cricket match played between Brentham and Hampstead tenants was a special Whit Monday feature for several years. The Brentham Club produced a number of well-known sportsmen, of whom the most famous was the tennis champion Fred Perry and cricketer Mike Brearley. Membership of the Brentham Club was restricted to residents, and a nominal subscription of 2s. 6d. a year was charged. The major cost was borne by Ealing Tenants, this being one form of profit-sharing made possible by the co-partnership system. The tenants' society also controlled the club and laid down the rules of conduct. These included a ban on alcohol and on Sunday games. In view of these principles it may seem surprising that no place of worship was included in the plans for the estate - unlike Hampstead which had both Anglican and Free churches. In 1906, however, a site was obtained at the corner of Pitshanger Lane and Castlebar Road for the erection of a temporary, corrugated-iron church. This original Church of St Barnabas was replaced by the present very large parish church at the corner of Pitshanger Lane and Denison Road. 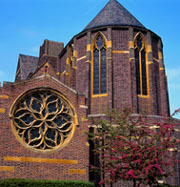 The new church, designed by F.C. Shearman and Ernest A Tyler, in a free Gothic style, was completed in June 1916.